Prepare dough in bread machine, by adding the water, olive oil, flours, yeast, sugar and seasonings in that order to the bread machine. Set cycle to dough. 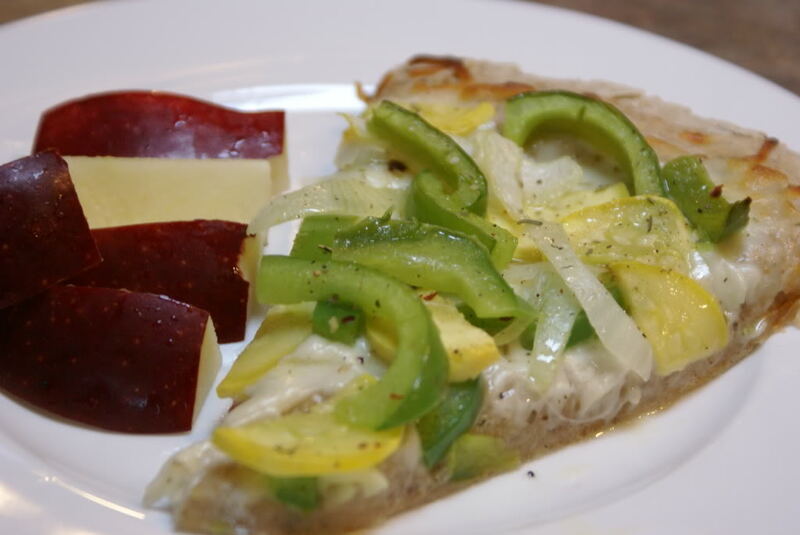 Slice green pepper, squash and onion into “pizza topping” sizes. Spread olive oil dressing over the pizza dough. (You could certainly use pizza sauce, but it didn’t sound appetizing to me tonight!) Top with shredded mozzarella and then place sliced veggies over the cheese. Bake at 400 for 15 minutes. Serve Homemade Veggie Pizza with sliced apples. 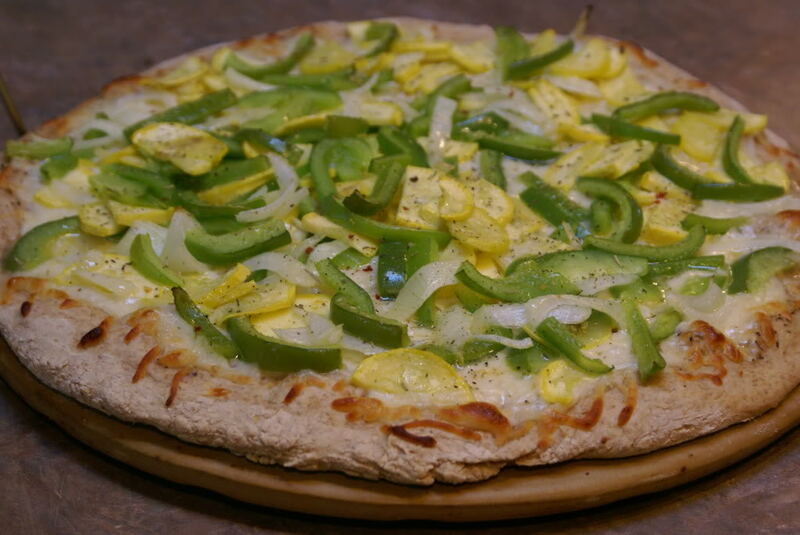 I love making pizza – it is my go-to recipe on a busy day. I keep extra dough and homemade sauce to make it quick & easy. I’ve never tried squash on pizza but it looks great! Fun! It’s a great party theme – BYOT – Bring Your Own Topping! Wow – we must have been synced our brains somehow. I made pizza tonight for dinner – but with gluten-free crust (so not quite $5 meal) AND I served it with apples. Almost exactly as pictured above. We love our pizza nights and I love that I can make two, and freeze one up for later! This looks really good!!! Now I want pizza!! Pizza is always great-I save leftover bacon,sausage and small slices of ham from breakfast in frezzer and then I use olive oil 1-2T sautee onion,greenpepper,mushrooms-remove from pan make milk gravy for my sauce. Great idea to stash leftovers to use for pizza toppings! Love it!